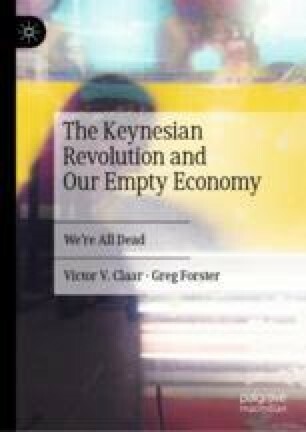 In the four remaining chapters of this book, we compare economic paradigms before and after Keynes in light of a question that surfaces the moral worldviews implicit in each. These questions reveal stark differences between paradigms before and since Keynes, and help reveal the connection between the Keynesian Revolution and the hollow prosperity that contributes to our current political, economic and social crises. In this chapter we ask, “How do economic systems allow us to make use of our world?” The Keynesian Revolution makes consumption primary, while previous paradigms made production primary. This undermines the formation of virtues essential to economic success: diligent work, frugal saving, social solidarity and other critical factors. These virtues are harder to form in the empty economy of hollow prosperity. Kennedy, John F. 1962. Speech at Rice Stadium, Sept 12. https://er.jsc.nasa.gov/seh/ricetalk.htm. Accessed 23 Jan 2019. Matarese, John. 2018. How Grocery Stores Are Just Like Casinos. KGUN-9, Feb 14. https://www.kgun9.com/money/consumer/dont-waste-your-money/how-grocery-stores-are-just-like-casinos. Accessed 23 Jan 2019. Thompson, Andrew. 2019. Engineers of Addiction. The Verge. https://www.theverge.com/2015/5/6/8544303/casino-slot-machine-gambling-addiction-psychology-mobile-games. Accessed 23 Jan 2019. U.S. Census Bureau. 2018. Business Formation Statistics, Feb 8. https://www.census.gov/newsroom/blogs/research-matters/2018/02/bfs.html. Accessed 23 Jan 2019.